The Toronto Blue Jays will be without closer Casey Janssen to begin the MLB season. Janssen has been placed on the disabled list, retroactive to March 29th, with a left abdominal/lower back strain. Sergio Santos will fill in as the Blue Jays closer. 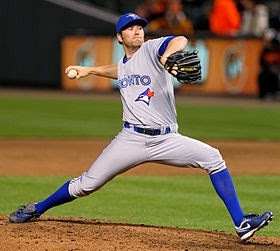 Bummer of a start to season for Blue Jays: Closer Casey Janssen placed on DL with left abdominal/lower back strain. Janssen has 56 saves for Toronto over the last two seasons. Santos has only appeared in 35 games for Toronto since being traded from the Chicago White Sox prior to the 2012 MLB season. He did save 30 games for the White Sox in 2011 and has 180 career strikeouts over 145.2 innings pitched.